The adventures in time and space continue, as the Doctor and his faithful companion Rose Tyler travel time and space fighting evil, righting wrongs and saving the course of history. This is the ultimate guide to the newest adventures of the Doctor: an archive of information, review and commentary, from the press to the production to the fans, as the venerable Time Lord returns to television in 2005 in a thirteen-part series that stunned viewers and critics alike. Back to the Vortex unfolds as history happened, from the announcements to the press releases, casting calls, the highs and lows, and the start of production. Discover the background to the new series, through the eyes of the press, the commentators and fans; read about the casting of Christopher Eccleston as the Doctor and one-time pop princess Billie Piper as Rose; and be there during the lead-up to the return of the traveling Time Lord to regular prime time television after sixteen years away. And as the show debuts, investigate the stories themselves, through detailed analysis, facts and figures, as well as extensive reviews and commentary with a panel of fans and aficionados spread across the world. This is the essential guide to the long awaited and anticipated return of the Doctor... and it's about time! Features an afterword by Rob Shearman, author of the episode "Dalek". Christopher Eccleston is ...the Doctor! The adventures in time and space continue, as the Doctor and his faithful companion Rose travel the universe fighting evil, righting wrongs and saving the course of history. Here, for the first time, is the ultimate guide to the newest adventures of the Doctor: an archive of background information, review and commentary, as the "Time Lord" returns to television in 2005 in a thirteen-part series set to stun viewers and critics alike. "Back to the Vortex" unfolds as history happened, from the announcements, to the press releases, casting calls, the highs and lows, and the start of production. Discover the background of the new series, through the eyes of the press, the commentators and fans; read about the casting of Christopher Eccleston as the Doctor and one-time pop princess Billie Piper as Rose; and be there during the lead-up to the return of the travelling "Time Lord" to regular prime time television after sixteen years away. And as the show debuts, investigate the stories themselves, in detailed analysis, facts and figures, as well as extensive reviews and commentary with a panel of fans and aficionados spread across the world. 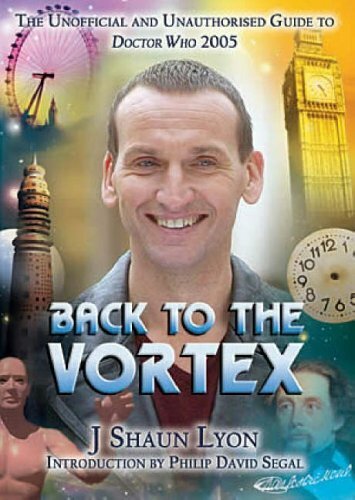 Contrary to comments made by a particular reviewer of my book on Amazon, the written contents of "Back To The Vortex" are available nowhere else online. The book has 436 pages of review and analysis and a twelve-chapter narrative that has never been in print before now.